Just one of the ways her cape is pimped out. Any part of an outfit that floats independently from the rest of the clothing. Done almost entirely for Rule of Cool, as there is little practical purpose for this. Sometimes this is justified by magic or Applied Phlebotinum, but even when it's not, this trope usually appears in fantastic or futuristic settings. In Far East Asian mythology (China, Japan, Korea) one trait the gods have, which is mostly associated with female gods, is the ability to defy gravity. This is reflected in art, where you'll see the gods have flowing hair and stoles (called tenne) that float in the air. A Holy Halo counts as this, when depicted as a floating circlet. Compare Impossibly Cool Clothes (which can even overlap with this) and Power Floats (which usually does). Not to be confused with clothing that gives the wearer anti-gravity abilities. When Rachel first shows her face in public in Glass Fleet, she wears a thick fur wrap that hovers over her shoulders. 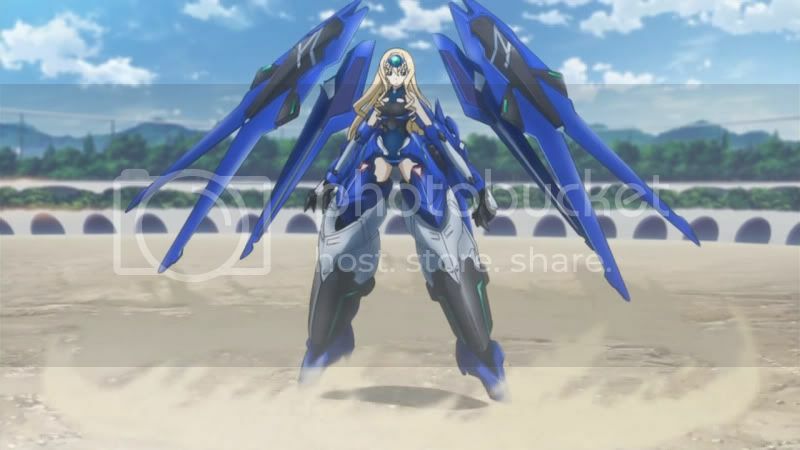 The Shoulders of Doom on the eponymous Powered Armor of Infinite Stratos are in fact separate units that hover in midair. While usually they inexplicably remain in place relative to the body, some armors ◊ are capable of using them as a form of Attack Drone. The members of Ryuugu royal family of merfolk in One Piece all have floating stoles. In particular, for Princess Shirahoshi, it's merged with her bra. The rings on Kyubey's ears in Puella Magi Madoka Magica don't actually touch the ears at any point. Sugino has a floaty stole in Tactics. 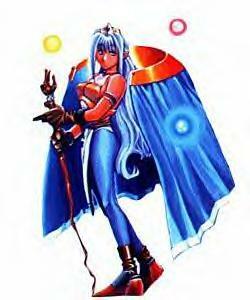 Yugi of Tenchi in Tokyo wears a cape of sorts that hovers around her. Dragaera: the Imperial Orb, a powerful magical artifact and the Requisite Royal Regalia of the Dragaeran Empire, orbits the head of the Emperor or Empress. The Dresden Files: In Skin Game, Hades has a crown of mordite made of pieces of the stuff floating around his head. In Trinity Blood, Seth's metal... circle thing floats around her shoulders. Dungeons & Dragons has Ioun stones that float around your character's head. Aside from the grey variety, they provide magical bonuses. They're also Color-Coded for Your Convenience. In BlazBlue, Amane's Scarf Of Asskicking floats above his head when he isn't using it to smack and drill opponents. In Devil Survivor, Amane's clothes float when she's possessed by Remiel. Some of the capes worn by the generals in Dragon Force. Including Tieris, pictured above. In Evolve, you can select a player icon from a predetermined list. 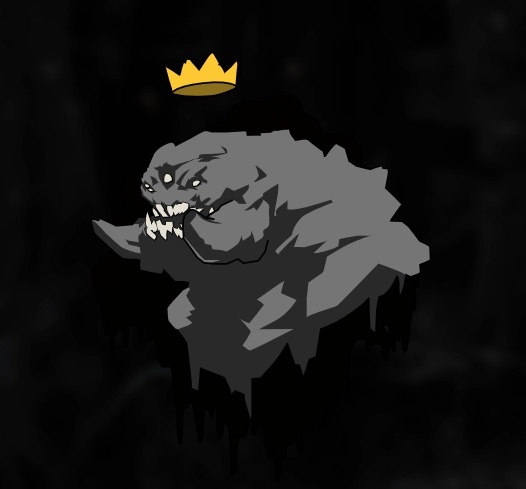 Players who have mastered a monster's abilities can add a floating crown to the icon representing that monster ◊. The Didact's armor in Halo 4 features levitating pieces, a design trait Forerunners are very fond of. Kantai Collection has Destroyers Murakumo, Hatsuharu and Nenohi, along with Light Cruisers Tenryuu and Tastuta having futuristic pieces of gear floating around them. Granted, they were all designed by the same artist. League of Legends has a few champions with weird floating neckpieces. One of them is a telekinetic so it makes sense. The other not so much. Jin Saotome's scarf in Marvel vs. Capcom. In Ōkami, Sakuya's stole floats above her head like a Japanese mystical figure would. The overskirt worn by the mages in Phantasy Star Online. Dahlia Hawthorne from Phoenix Wright: Ace Attorney - Trials and Tribulations has the floating stole, signifying that there is something otherworldly about her. Same goes for Nahyuta Sahdmadhi from Phoenix Wright: Ace Attorney  Spirit of Justice. Caitlin from Pokémon Black and White has hair, bows, and a transparent cape that does this. Justified in that she's psychic. In Rune Factory 4, the three butlers Volkanon, Vishnal, and Clorica all have some sort of lacy armband that just floats next to their sleeve. Celine's shower curtain thingy and her hat-brim halo in Star Ocean: The Second Story. The divine stole mentioned in the description (called a hagoromo in Japanese) shows up a few times in Touhou. Oddly, never with actual gods. Kael'thas has three green orbs floating around him called Verdant Spheres and World of Warcraft players can loot one for themselves after beating him. As well as some of the armor pieces characters can wear in World of Warcraft. One example is the Poison Protocol Pauldrons , which seem to be three straps of leather surrounding an orb of blue fire on either shoulder. When looked at on the character, they don't actually touch the chest at all. Marcus from Hell(p) wears a beanie with a pompom on a string that floats like it's made of helium, giving him a bit of an Idiot Hair look. Rank tabs in Schlock Mercenary hover above the wearer's shoulders. The Floaty Buttcovers in the far future of Unicorn Jelly. The Fairly Oddparents: the Floating Crowns (mentioned in the theme song). And part of Timmy's hat. The rings on clothing in The Jetsons. This was Homaged in other series, like Futurama. The hats in The Mr. Men Show. Except for Mr. Lazy's hat, that is. The Mayor's hat in The Powerpuff Girls. Steven Universe: Pink Diamond has white pompoms on her shoes, or rather, floating above her shoes.